On 13 July, H.E. 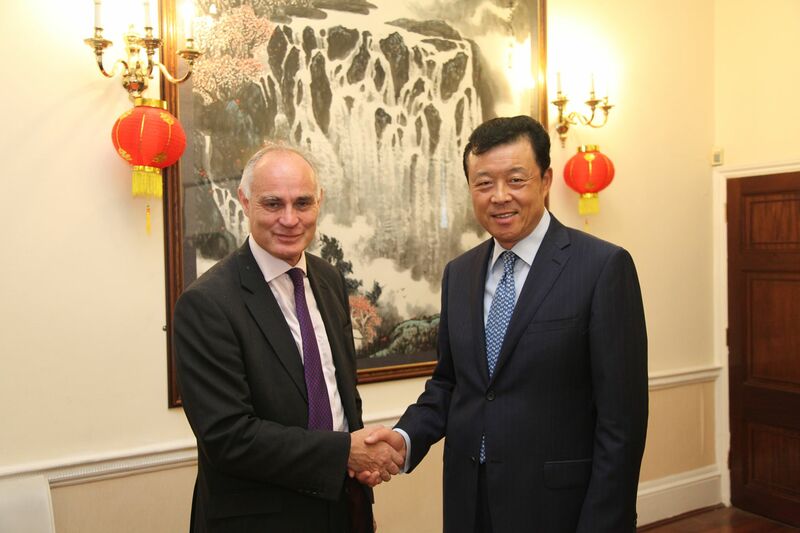 Ambassador Liu Xiaoming met with Crispin Blunt, Chair of the Foreign Affairs Committee of the British House of Commons. They exchanged views on China-UK relations and parliamentary exchanges. Ambassador Liu congratulated Mr. Blunt on his new position, and pointed out that China-UK relationship is entering a period of comprehensive development and that President Xi Jinping's upcoming state visit to the UK will open a new chapter in the bilateral ties. Parliamentary exchanges are an important part of the bilateral relations. The National People's Congress of China and the British Parliament have established a mechanism of regular exchanges. Ambassador Liu hopes that, under the leadership of Mr. Blunt, the Foreign Affairs Committee will play a positive role in enhancing political mutual trust and promoting China-UK cooperation in various fields. Mr. Blunt stated that the Foreign Affairs Committee follows the rapid development of China closely and attaches importance to the country's rising international influence. He will, during his tenure, work to promote the development of the UK-China relations and the exchanges and cooperation between foreign affairs committees of the two legislatures.